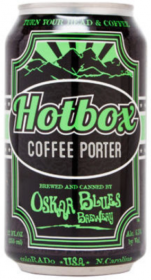 Hotbox Coffee Porter is an American beer, it has an alcohol content of 6.4%. This porter is based on malt flavors of roasted nuts, crème brulee, cocoa, and caramel, extracted from English and German roasted and caramel malts. Hotbox Roasters then crashes the party and infuses potent, cold-extracted coffee from Burundi and Ethiopian beans and deals out flavors and aromas of dark plums, chocolate, and hints of blueberry.